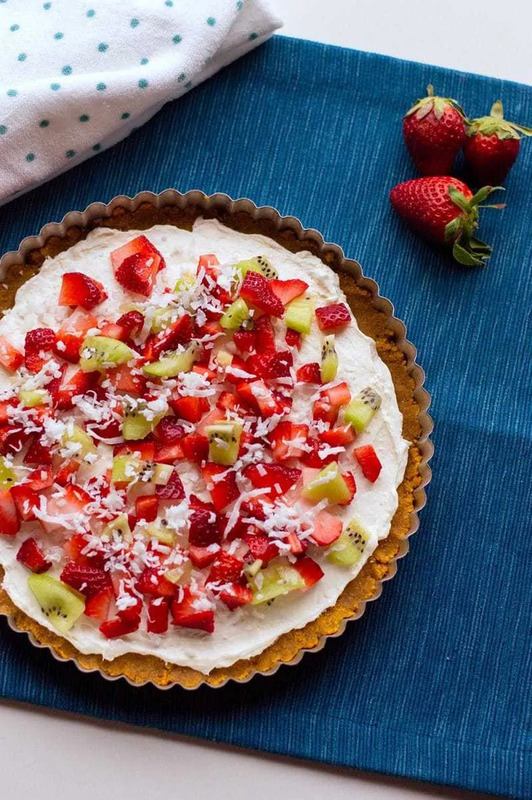 With cream cheese and fresh fruit on top of a homemade graham cracker crust, this no-bake fruit pizza recipe makes a perfect summer dessert. Pizza is a always a favorite in our house, so I figure why not enjoy pizza for dessert as well? 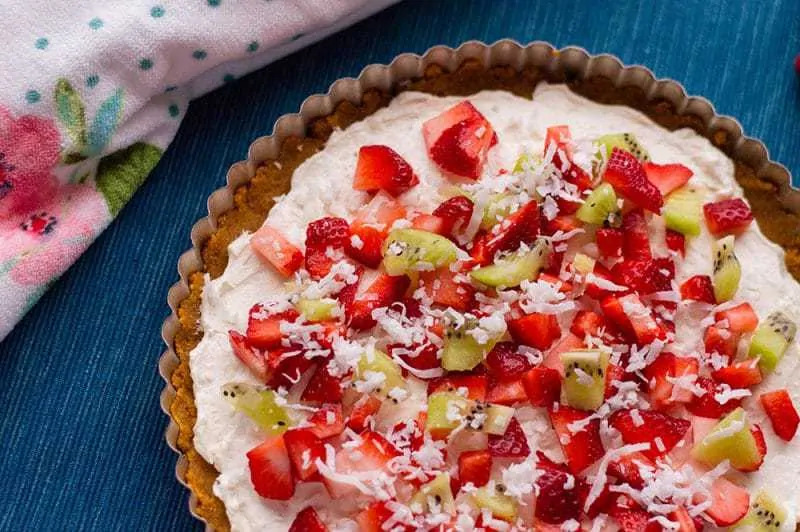 With a homemade graham cracker crust, cream cheese “sauce,” and fruit toppings, this fruity dessert pizza is the perfect combination of sweet, creamy, and juicy. If you like this dessert pizza, check out these easy carrot-shaped veggie pizza bars. 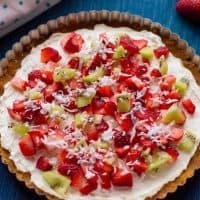 This easy and colorful dessert recipe is especially great for summertime, as it is lighter than a typical cake or pie. 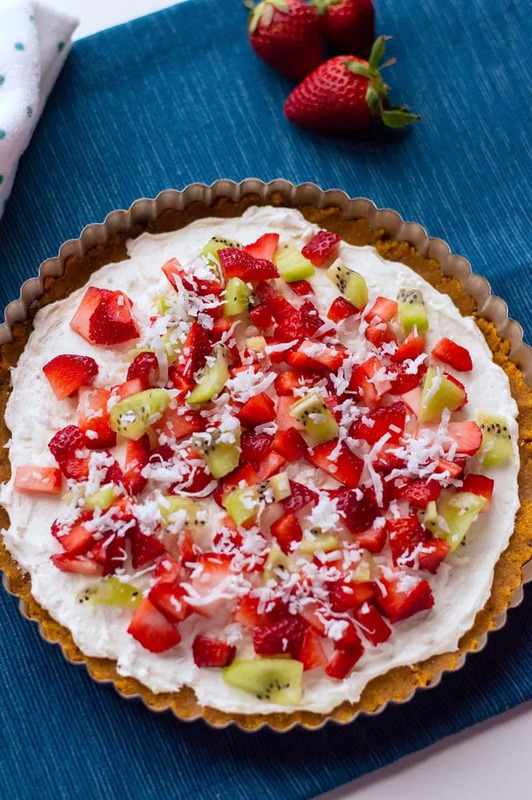 In fact, you will find that fruit pizza is a great dessert to serve at summer BBQs. Everyone always loves it and comes back for seconds, so just make sure that you make enough so you don't run out! Start by gathering your ingredients and supplies. For this fruit pizza we used a 9 inch tart pan with a removable bottom. 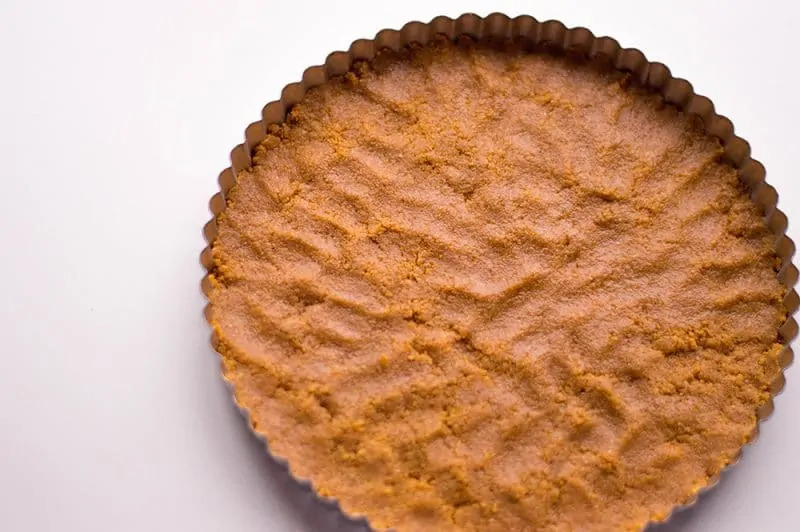 You will need crushed graham crackers and butter for the crust. Use a food processor or blender to crush your graham crackers. Or you can go old-school and pop them in a zip-top plastic baggie, remove the air, and break them up with a rolling pin. For the cream cheese filling you will need: cream cheese, sugar, and frozen whipped topping. As for the fruit topping, feel free to use whatever fresh fruit you prefer. While we topped our fruit pizza with kiwi, strawberries, and coconut flakes, you can easily customize the toppings on your fruit pizza, just as you would customize a regular pizza with your favorite toppings. 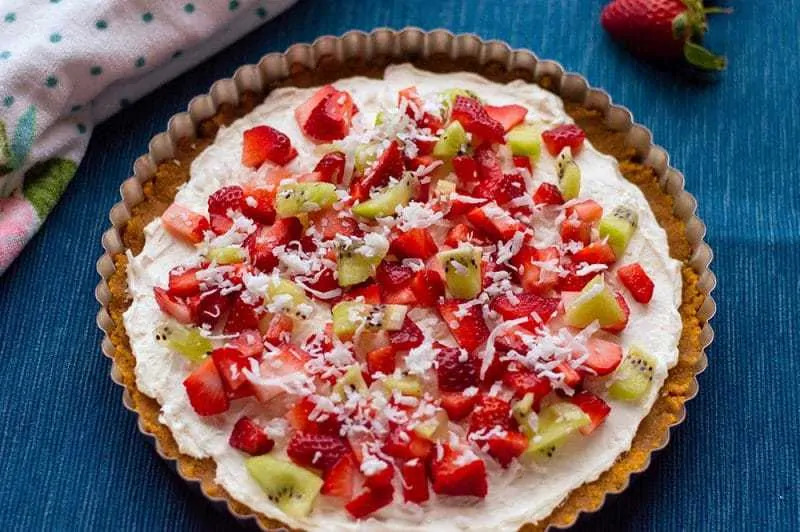 A red, white, and blue fruit pizza with strawberries and blueberries would be perfect for Memorial Day or the 4th of July. For other occasions, just use your favorite combination of toppings. 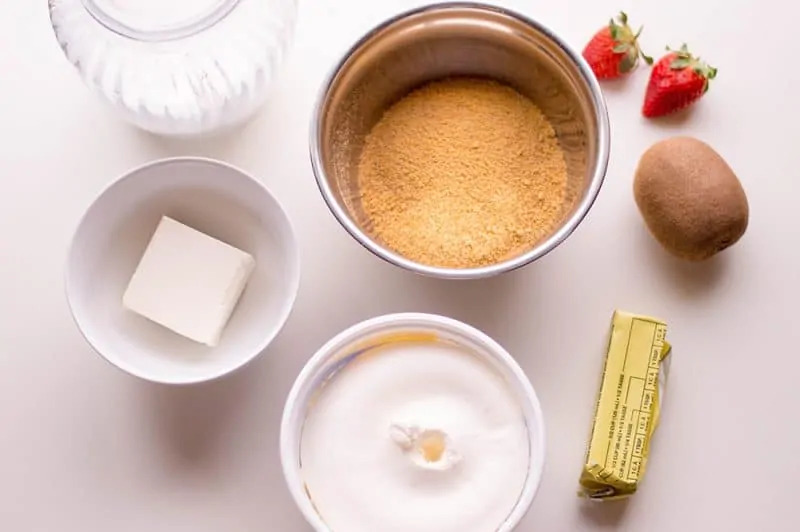 Start by mixing together graham cracker crumbs and butter. Then, press the graham cracker mixture into your tart pan to form the crust. Next, use a stand mixer to mix the whipped topping, cream cheese, and sugar. Spread the cream cheese filling evenly into the pan and allow to chill in the refrigerator for 2-3 hours. 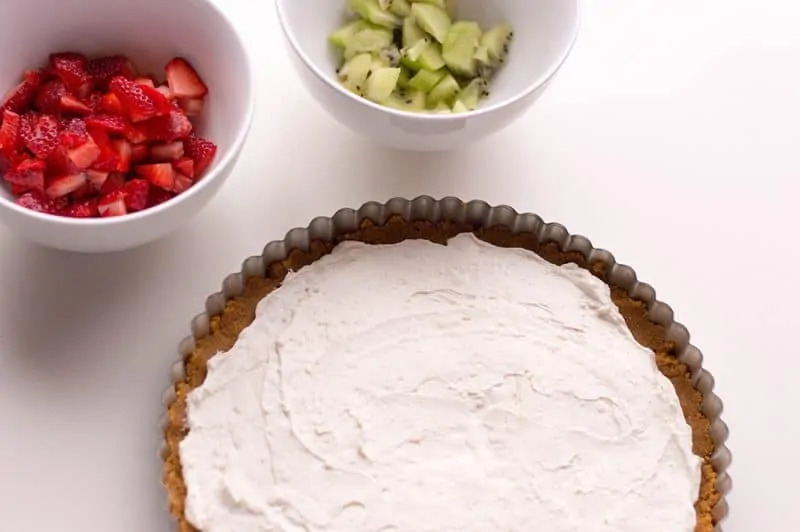 Once chilled, top your dessert pizza with fresh fruit. Feel free to have the little ones help decorate – they will love putting the toppings on their “pizza”! 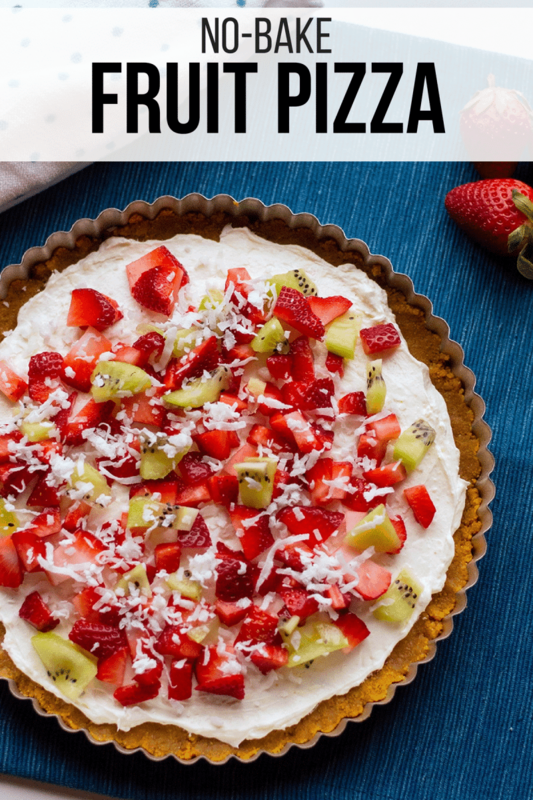 I hope that your family enjoys this fun fruit pizza recipe. Let us know how they like it in the comments below. 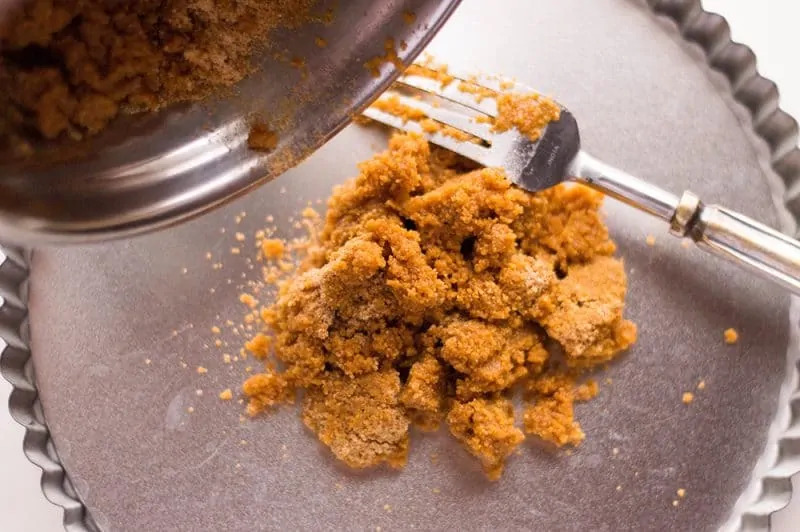 In a medium-size bowl, mix graham cracker crumbs with melted butter. Press mixture into pan and set aside. Using a stand mixer, mix together cream cheese, sugar, and whipped topping. Scoop mixture into graham cracker crust and spread evenly. Let set in the refrigerator for about 2-3 hours. Once set, top with your choice of fruit. This is something I’ve never seen before. It looks delicious. Thanks for posting! Mmm I never would have thought of adding coconut – yum! Great summer snack. This is sure to be a hit at summer get-togethers! YUM! My son would appreciate this – I need to cook more meals at home for him like this.